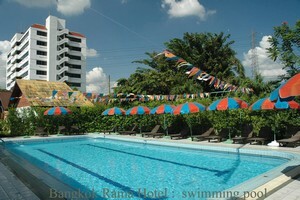 Bangkok hotel 10 minutes drive from and to Bangkok International airport (Suwannabhum) 5 minutes walk from Hua Mark airport link train station(2009). Clean, Secure, Quality Bangkok accommodation of hotel standard foundation and Hostelling International (HI) guarantee for your satisfaction. 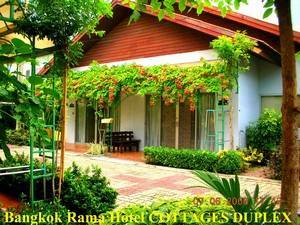 Airport pick up transfer for more than 2 standard room-nights stay. Call upon arrival with prior appointment for Free pick up from Hua-Mark airport link train station. Easy access to inner Bangkok and major tourist attractions by elevated expressways and only 1 hour drive to the famous beaches at Pattaya and 2 hours to Samed Island. 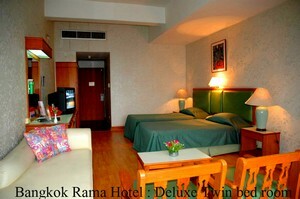 3 days 2 nights tour to the east of Thailand by Your Associates Travel can be attained at the hotel. 2 body towels, 2 hair towels, 2 hand towesl, bath mat, shower gel, shampoo, shower caps, bath foam, 30gm. soap bars, toilet paper, inroom TV, daily linens changing. Standard resort bungalow twin , ensuite, toilet with shower, air-conditioned, ventilation toilet, TV, IDD telephone, internet access prepaid card. working lighting. Standard resort bungalow double bed, ensuite, toilet with shower, air-conditioned, ventilation toilet, TV, IDD telephone, internet access prepaid card. working lighting. 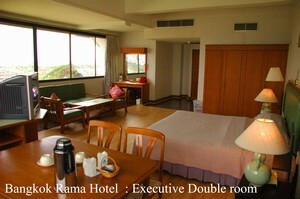 Standard room twin or double bed, ensuite, tolet with bathtub, air-conditioned, TV, IDD telephone, internet access prepaid card, working lighting. Female or Male double deck bunk beds in resort bungalow, 6 in each connecting bungalow. Kasem Bundit University 1 km. Phraram 9 Hospital 9 km. Airport link station -HuaMark 1 km. credit card guarantee for reservation and 1 room-night charge for no show guest without cancellation notice 72 hours prior booked date. 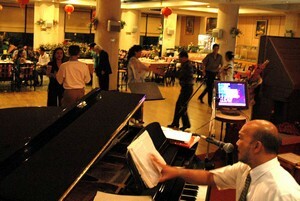 Account can be settled at the hotel front desk upon arrival check in registration by cash or credit card. No refund policy. 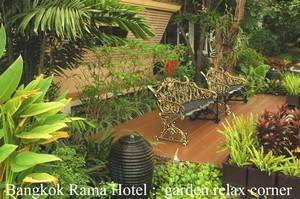 The hotel is right on the main street of Pattanakarn Road between soi 48 and 50, 400 meters from Pattanakarn - Srinakarin traffic intersection. Bus route 550 from BKK airport. Airport link rapid train station is to open very soon and only 5 minutes walk to the hotel. Public buses and meter taxis 24 hour.